Interns: Gregory Patton, Emily Johnson, Eileen Sugameli, Katherine Grant-Suttie, & James Greisler, Jr.
David Bryan Jackson* (Fat Castaway) was recently seen in Henry IV, Part 1 at the Folger Theatre, where he was also in All’s Well That Ends Well and Much Ado About Nothing. Other area appearances include Via Dolorosa at Theatre J., Hamlet, Timon of Athens, The Merchant of Venice,& Henry V with the Shakespeare Theatre, The Chairs, One for the Road, and The Persians with Scena Theatre, Martha, Josie, & the Chinese Elvis at Woolly Mammoth, Guantanamo, Privates on Parade and The Invention of Love at Studio Theatre, Jumpers at WSC, Intimate Exchanges at Source Theatre, My Night With Reg at The Actors’ Theatre of Washington, How to Make an Apple Pie at the Kennedy Center, Dangerous Liaisons at Rep Stage, and Arcadia, Good, and Mad Forest, with the Potomac Theatre Project at Olney Theatre, where he was also in Amadeus, Dracula, Peter Pan, and Racing Demon. He recently directed Krapp’s Last Tape for Keegan Theatre. *Member of Actors’ Equity Association, the Union of Professional Actors and Stage Managers in the United States, appearing under a Special Appearance Contract. Stephen Shetler (Medium Castaway) studied acting at The Catholic University of America and The Royal Academy of Dramatic Art. He has acted in over 25 professional productions, many as a company member at Classika Theatre in Arlington. “Out at Sea” marks his return to professional theater after a hiatus of seven years. Rob Weinzimer (Thin Castaway) was seen most recently as Judge Alvin Haley in The American Century Theater’s production of Native Son. Rob has performed at Woolly Mammoth & Theater J in staged readings in collaboration with the Theatre Lab School of the Dramatic Arts in D.C.& is a 2008 graduate of the Honors Conservatory program at Theatre Lab. T. Anthony Quinn (Postman, Butler) is a graduate of The Choate School, Amherst College, and Emory University. He has performed up and down the East Coast from the Atlanta Shakespeare Company in Georgia to the Weston Playhouse in Vermont. Somewhat shockingly, this is his second time in a Mrozek play. Many years ago, he played Vatzlav in Mrozek’s masterpiece of the same name. Tony says, “I look forward to being considered the foremost interpreter of Slawomir Mrozek in the American Theater … or at least one of the biggest interpreters of his work.” Tony lives in a crowded townhouse on Capitol Hill with his wife, three children, dog, and bunny rabbit. Look for Tony playing Officer Pinky in the upcoming feature film The Six Wives of Henry Lefay. 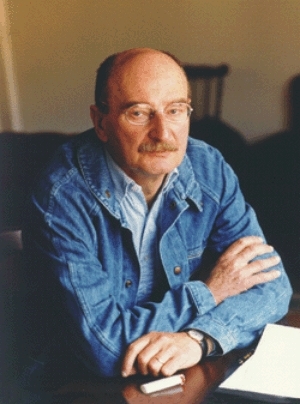 Sławomir Mrożek is a renowned playwright, dramatist, prose writer, drawer and cartoonist. He is known for his ability to tie alienation, abuse of power, conformity, and the restriction of human rights and freedom under a totalitarian system into his satirical, dark comedies. Sławomir Mrożek was born in 1930 in Borzecin, near Cracow. The fuel behind his literary and artistic fire came when he was a child living during the Nazi occupation of Poland. Mrożek once said, “The monster kept me imprisoned, but it fascinated me a lot at the same time.” Before becoming a playwright, he studied architecture, painting, and Oriental philosophy. He wrote his first play, Policja (The Police) in 1958. He, along with other playwrghts, brought new voice and technique to the Polish theatre during that time, a style known as The Theatre of the Absurd This concept was developed by author Martin Esslin and was the topic of his book by the same name. Absurdists are generally considered European non-naturalistic playwrights who dramatized the meaningless, uncertain nature of life. Mrozek’s short stories of human fault, behavior, and Polish temperament, are what brought him to an international level of attention. His comical stories are assumed to have underlying messages of his bitter views of Stalinism, the conditions of Poland, or general disapproval of a modern totalitarian state. His works were met with force by the Communist Polish government. Mrozek’s plays, along with the work of other playwrights, were prevented from being published in Polish papers and performed on television with the initiation of Martial Law in Communist Poland in 1981. He along with Solidarity leaders were silenced to keep democratic opposition from gaining support. His plays were performed in London, New York, and Paris among other countries. He has received many awards for his work including the highest French national distinction, Chevalier de la Légion d’honneur, in 2003. Mrozek’s plays continue to evoke laughter, dicomfort, self-reflection, and overall enjoyment internationally, as they are expected to continue doing so for years to come. Three men find themselves on a makeshift raft in the middle of the ocean. With hunger setting in and no hope of rescue, they discuss the limited available sources of sustenance. The hilarious conversation that ensues explores the folly of human nature in all its comedy and pathos, as well as the way that class, politics, and Darwinian natural selection intrude upon even the smallest of communities.